"When a person realizes himself to be an eternal servitor of Kṛṣṇa, he loses interest in everything but Kṛṣṇa's service. 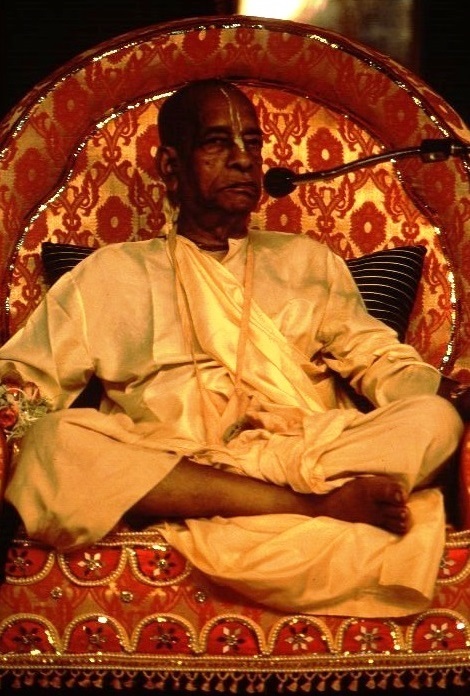 Always thinking of Kṛṣṇa, devising means by which to spread the holy name of Kṛṣṇa, he understands that his only business is in spreading the Kṛṣṇa consciousness movement all over the world. Such a person is to be recognized as an uttama-adhikārī, and his association should be immediately accepted according to the six processes (dadāti pratigṛhṇāti, etc.). Indeed, the advanced uttama-adhikārī Vaiṣṇava devotee should be accepted as a spiritual master. Everything one possesses should be offered to him, for it is enjoined that one should deliver whatever he has to the spiritual master. The brahmacārī in particular is supposed to beg alms from others and offer them to the spiritual master. However, one should not imitate the behavior of an advanced devotee or mahā-bhāgavata without being self-realized, for by such imitation one will eventually become degraded."